Create your own fame and fortune to live like a star. Glu Mobile released the highly anticipated Kim Kardashian: Hollywood mobile game for both iPhone and Android platforms. It's not an easy road to the top. After a chance encounter, you go from being a clothing store clerk to basking in the spotlight at the hottest events with Kim Kardashian West herself. You experience the drama and excitement of earning Hollywood notoriety by completing projects and tasks that lead to new career opportunities. This guide will give you a few tips and strategies on how to navigate your way to stardom. How do you play Kim Kardashian: Hollywood? As Kim's trainee, you're constantly on the move doing photo shoots and meeting her at events to network with people. Start the game by 'Kustomizing' your character to your liking, or select the randomize feature to get started. You can always customize your character later as you play the game, so it's not absolutely necessary at the beginning. Complete tasks to get experience points and cash; tasks cost energy and refill with time and leveling your character. Significant tasks like a photo shoot or date are rated by the amount of smaller tasks you complete within the allotted time. How does Kim Kardashian fit into the game? Kim is your mentor to stardom. With her guidance and influence, you're introduced to people within her circle that can help you in your adventure. Kim Kardashian doesn't take no for an answer, so choices are limited with tasks that she issues. Being associated with Kim will create opportunities for you on your quest for fame. Take her advice and meet with people she introduces you to regularly. How do you gain experience in Kim Kardashian: Hollywood? Complete tasks and tap items within the environment to find experience points that will help you level up. Going on dates is a great way to level up as you gain plenty of experience from doing the smaller tasks within the date. Any major task like a photo shoot or date will help you gain experience quickly. How do you earn money in Kim Kardashian: Hollywood? Tap items within the environment to find money and complete tasks. Interact with people within the game to earn cash. Successful interactions can earn you experience as well. Each successfully completed task will put some money in your pocket. You'll need money to do things within the game, like travel, buy clothes, condos and various items. How do you earn Charm points in Kim Kardashian: Hollywood? Earning Charm points are more difficult and can be obtained by doing tasks assigned to you from Kim. Get Charm points by leveling up your character and completing bigger tasks that progress the storyline. Charm points let you purchase clothing items, specialized items like pets (Charli) and convince people to agree with you. Try to save your charm points to influence people in conversations for added benefits. How do I get a higher listing in Kim Kardashian: Hollywood? Rising to stardom isn't an easy task. In order to do this, you have to take advantage of every opportunity. Go on photo-shoots and dates regularly; try to date people who are more popular and have a higher listing than you. In addition, change your clothes regularly to stay current with trending fashions to look your best for social events, dates and photo shoots. Can I play Kim Kardashian: Hollywood with my friends? Kim Kardashian: Hollywood is a social game where you interact with your friends through social media and GameCenter. Login to Facebook to connect with your friends and see what their ranking is and how many fans they have. You can keep tabs of their progress via Twitter and see what achievements they unlocked via Gamecenter. It may be possible to meet up with your friends through the game as you interact with other players who are on a similar quest to stardom. Does Kim Kardashian: Hollywood cost anything to play? 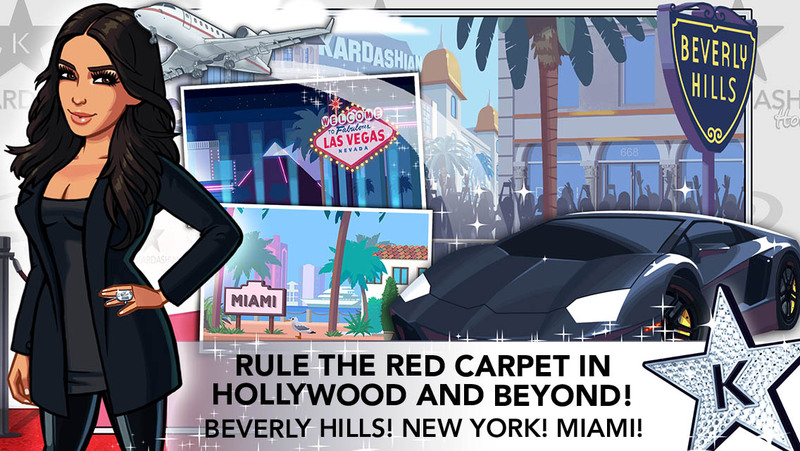 Kim Kardashian: Hollywood is free-to-play with microtransctions. Thankfully, you don't get stuck when you run out of energy to complete tasks. Go explore, meet people and search the game while you're waiting for energy to rebuild.